It wasn’t in the most auspicious style, but John Russell (Bristol RC) survived a crash and a feisty finale to place high enough to take crucial series points and retake the series lead from Charlie Revell (Team Tor 2000 Kalas) by five points. Will Page improved on two third placed finishes earlier in the series to take the win ahead of David Mixell (Bikestrong-KTM) which was also his best result of the series so far. Both these riders now climb up the overall standings into 3rd and 4th respectively, hinting at a potential challenge for the top spots over the final few rounds. Conditions were tough, with a misty rain and strong winds meaning that there was little mercy for riders outside the main group. 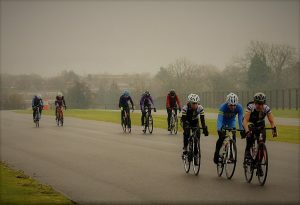 The prospects of another successful breakaway after James Phillips’ win last week were dealt a further blow when a strong move featuring Russell, his teammate Andrew Edwards, Jack Salvidge (BPF Cycling) and Rob Hardyman (Forever Pedalling) was thwarted by a bizarre crash. Seemingly caught by a gust of wind, the riders overshot the fast right-hander and ended up on the grass. Russell was the only rider to come down, and fortunately all four riders were able to recover their way back to the main group. Edwards had waited to pace Russell back to the group after the crash and in the confusion following, it was Tom Grigson (Bikestrong-KTM) who had forged ahead. However, riding alone in the wind meant that the bunch never really looked troubled and a sprint was inevitable. 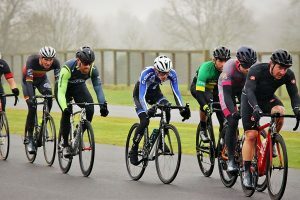 Behind Page and Mixell, Tim Southcombe (Somerset Road Club) continued the trend of riders seeing their placings improve as the series has gone on. He was third place, bettering his previous best finish of 8th and moving him into the top ten overall. The wind also played a pivotal role in the women’s race. With the smaller groups in the pursuit format, there was nowhere to hide as echelons formed time and time again coming up the finish straight. The 2nd/3rd cat group split in their pursuit of the 4th cats, opening the door for some of the lower category riders to snipe a highly placed finish. 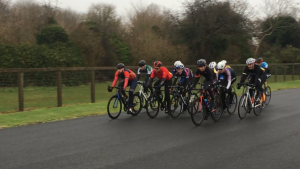 Lucy Gadd (Liv-Halo CC) was the pre-race favourite coming off an impressive final season as an U16, and tested the main group a number of times early on. 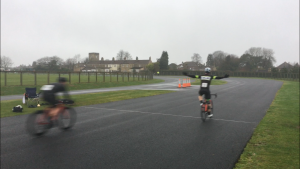 However, it was last week’s winner Illi Gardner (Veloflow) who again triggered the decisive split. She charged clear with Gadd and series leader Johnston (Avid Sport) with Rebekah Nash (Uni of Bristol) and Stephie Prince (Cotswold Veldrijden) just a handful of seconds behind. Prince was backing up her win in the 4th cat race brilliantly by sticking in the mix with the leaders as she and Nash held the front three close throughout the final laps. Gadd wasn’t waiting around for a sprint though and jumped clear going into the closing kilometres. Gardner wasn’t letting her away easily though and set about trying to reel the young rider back in. With Nash and Prince still just off the front group, there was still the chance that it could all come back together in time for a sprint finish with only a handful of second covering the top five. But Gadd would not be denied, holding on to take the win by a single second from Gardner who herself had managed to put one second into Johnston, who had ridden a canny race on what she described as an “off day”. Prince finished nine seconds further back, two seconds clear of Nash who again paid for perhaps spending too much time working to the benefit of others. 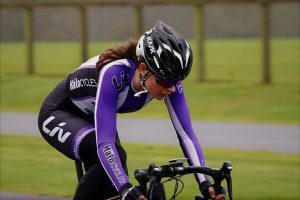 With her third place, Johnston takes her lead out to 76 points ahead of Jenny Bolsom (9th – Bikechain-Ricci) and a further 9 points to Nash who climbs up to third overall. Strong results in the past two rounds from Gardner and Prince have moved them both up the standings to 7th and 8th overall. With four rounds still to go, they are well within reach of the podium spots. The men’s 4th cat race was also defined by the wind, which made life very difficult for those towards the back of the group and discouraged any riders from making a bid forwards for a breakaway. Nevertheless, with the front group reduced to 13 riders by the finish, nobody scored points without earning them. Steve Beal (Royal Dean Forest CC) took the win by less than half a wheel from Bath CC’s Elliot Barratt. The pair were well clear of William Hayes (UK Biking) who had himself put quite a gap to the rest of the sprint. Barratt is the best placed of those riders overall in 16th place, and he will be looking to build on that position as he moves up to 3rd category. Hayes is only a few points behind but is down in 30th overall in a very tightly packed fight for a top 15 spot, with 27 riders covered by only 30 points with four rounds remaining.